Right now, applejack is quite possibly my favorite spirit. Sure, I love sipping whiskey and trying out new gins, and cognac is great and I’m gradually warming to tequila, but I’ll always love applejack. For those of you familiar with this quintessential American spirit, skip ahead a few paragraphs and get to the drinks. For those unacquainted, read on. Applejack — with a lowercase “a” — is essentially American apple brandy, apple brandy being a distillate of hard apple cider. Because it comes from a fruit, and because it’s aged, it’s technically a brandy (unaged it’s really an eau-de-vie, and it is clear), though as Ted Haigh notes, it behaves a bit more like a whiskey, being brasher and less mellow than its French cousin, calvados. Early in the history of the U.S. it offered serious competition to rum and whiskey, namely because hard cider was so plentiful. 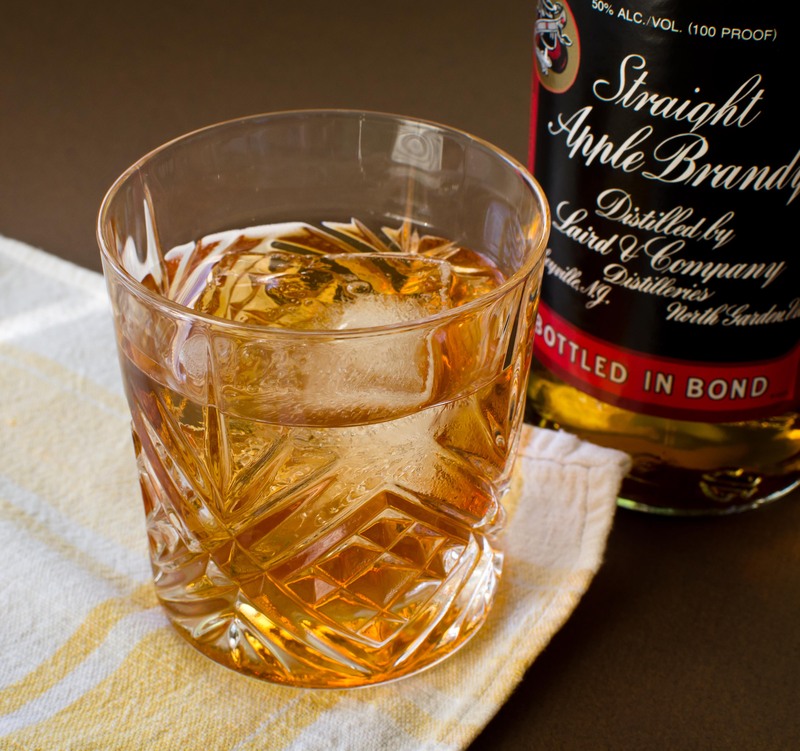 As more and more spirits entered the market and became more refined, however, applejack gradually fell by the wayside, and Prohibition officially did it in. The sole exception was Laird & Company in Scobeyville, New Jersey, who were among the first producers of the spirit in the country (the first batch dates from 1698, and they gave away their recipe to George Washington when he fired up his own distillery at Mt. Vernon). Laird bought up many of the apple brandy producers when they went under in the 1930s — probably part of the reason that they survived. Now, Applejack — with a capital “A” — is one of the four Laird’s products on the market, and is a blend of neutral spirits and apple brandy. “Applejack” itself is a slang term that was officially adopted by the company in the 1950s. The blend isn’t bad, but Laird’s 100-proof bottled-in-bond apple brandy is truly exceptional, as is their 7 1/2-year-old apple brandy (recommended for sipping). I’ve neither seen nor tasted the 12-year-old, but I’m sure it’s wonderful, as well. Best of all, Laird’s in any form is very affordable, setting you back about $18 to $24, depending on which brandy you get. Shake with ice and strain into a chilled cocktail glass. Garnish with a lemon wedge or a lemon twist (or a lime wedge, if using lime juice). According to Haigh’s Lost Spirits & Forgotten Cocktails, the name “Jack Rose” is still a bit of a mystery. The possibilities include: 1) an applejack drink that is rose-colored, probably the most likely, 2) named for the Jacqueminot Rose of a similar color, or 3) named for Jack Rose, a gangster of ill repute in the early 20th Century. Take your pick. Recipes for the drink also vary, namely in proportion and the use of lemons and limes. Me, I prefer the lemon version…lemon just seems to pair well with apple brandy, much like it pairs well with brandy and whiskey. The result of mixing these three ingredients is a drink that is refreshing and tart, the pomegranate and lemon highlighting the apple flavors of the brandy. As for tinkering, well, maybe some sort of bitters could be added…I really hate to mess with such a classic, however. Oh, and the above recipe comes from the PDT Cocktail Book, which, after trying numerous other ratios, happens to match my preferred ingredient ratio (Jim Meehan references William Boothby’s World Drinks and How to Mix Them, 1908). Stir with ice and strain into a double rocks glass over a big ‘ol chunk of ice. The Applejack Old-Fashioned is an oh-so-simple adaptation that I ran across on Paul Clarke’s site. The sweet, barrel-aged flavors are enhanced in this drink, as opposed to the tartness of the apples highlighted in the Jack Rose. For the maple syrup, get the real stuff — no Log Cabin, Hungry Jack or Mrs. Butterworth — and use Grade B, which has a darker, richer flavor (it’s often released in the Fall, but you can usually find it year-round with a bit of looking). As for the bitters, Fee Bros. Aromatic or even Angostura will work in a pinch. The goal of the Old-fashioned-style drink is, I think, to bring out the richness of whatever dark liquor it’s mixed with; on their own, on the rocks, liquor has a chance of diluting a little too much, resulting in a “thin” drink. Sugar and bitters help restore a bit of the velvety mouth-feel without restoring the burn of the alcohol. Combine all ingredients without ice and dry shake, then add ice and shake. Strain into a cocktail glass or small wine glass, then grate some nutmeg over the drink. A flip, you may ask? What the heck is a flip? Well, combine booze, sugar, and a whole egg in a shaker, and you have a flip. Sort of like a primitive eggnog. 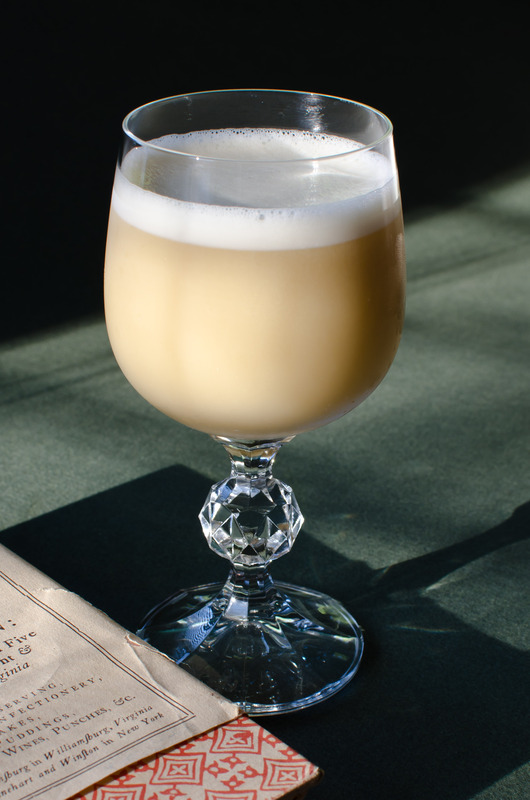 In fact, the Fort Washington Flip turns out very much like egg nog, but with a bit more boozy sharpness. Thanks to the nutmeg, Bénédictine, and maple syrup, the FWF has wonderful herbal spiciness to it, while the bottled-in-bond apple brandy cuts through the richness a bit. This particular drink served as my appetizer before Thanksgiving dinner. These are just a handful of the applejack drinks that are out there, but they provide a good starting point (particularly the Jack Rose). Maybe there’ll be an Applejack: Part 2? We’ll see. Cheers. Great post, will we be sampling these? Our punch at Christmas will feature the 100-proof apple brandy, but you’re welcome to try the liquor on its own! That being said, I’d love to have an apple brandy cocktail night at some point. 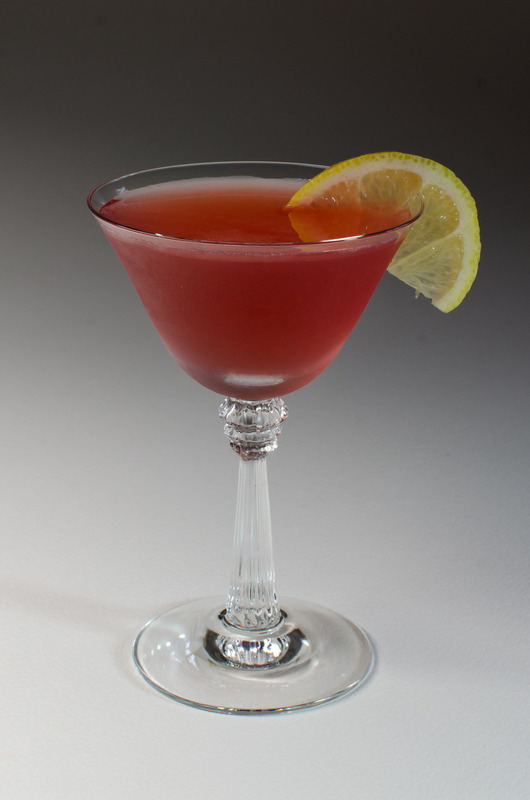 This entry was posted on November 27, 2011 by IJ Lauer in Apple Brandy, Benedictine, Drink Recipe, Eggs, Grenadine, Lemon Juice, Spirit Information, Whiskey Barrel-Aged Bitters and tagged apple brandy, applejack, applejack old-fashioned, cocktail, drink, egg, fort washington flip, grenadine, jack rose, lemon, maple syrup, recipe, whiskey barrel aged bitters.